In this chapter, we talk about they type of mindset your team needs to have when creating and growing your dental membership program. 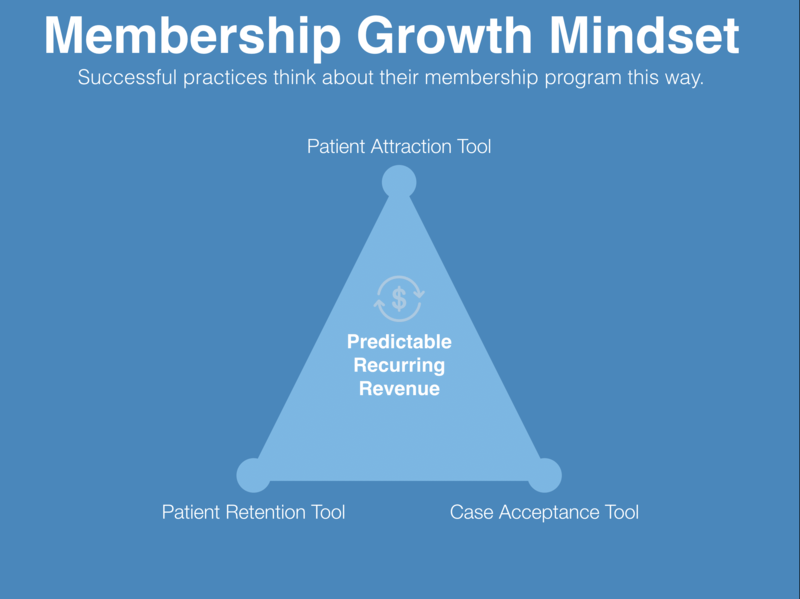 In order to have successful dental membership program, your practice needs to follow the growth framework. In order to grow and scale your dental membership program you will need to make sure your program has these core tools or mindsets. Let’s talk about these in detail. You need to make sure your membership program is used as a patient attraction tool or a marketing tool. Too many offices use their program to sign up only existing members,While this is a great way to capture low hanging fruit, you need to make sure you use it as an external marketing strategy where you use Facebook, Direct mail, b2b marketing, Public relations, news, articles, radio – we will talk about marketing strategies in detail in the marketing section. The biggest challenge for most businesses is retaining customer or patients. When a patient signs up for your membership program they are committing to your practice. Make sure you have the proper agreements in place and make sure your patients know that they are signing up for a loyalty plan like amazon prime or Costco which auto renews each year. Using a membership program as a case acceptance tool is the best strategy to get patients to say and spend more with your practice. On average patient members spend between 104% to 240% more than non-members. When patients realize they can get some savings by becoming a member, make sure you remind them that they will always get savings and benefits by being a loyal member. Recurring revenue is my favorite topic! I even have a custom designed shirt that says “Recurring Revenue” – I am kinda weird. If you set up your membership program and it doesn’t have a yearly or monthly recurring revenue component to it, well it is not really a membership program, it’s a wannabe loser program. Recurring revenue is the holy grail to business revenue. The more patients you sign up the more and more predictable recurring revenue you will generate. Imagine if you had 1,000 patients paying you 35/mo – that’s 35,000 per month of revenue that comes in weather you do dentistry or not! This can be done! We have seen practices all over the nation achieve thousands of patients! When you create your membership program keep the growth framework in mind. If you have questions or want to chat with me about your membership program goals reach out to jordon@boomcloudapps.com ROCK ON!